The weather is starting to getting nicer and the days are getting longer, which means I am ready to start Spring Cleaning. I love nothing more that creating a home that is inviting not only to us on a daily basis, but friends and family. I start looking forward to weekends when I can enjoy those breezing afternoons where I can open up the windows, diffuse my Young Living Essential Oils in my diffuser and spend the day getting my house clean from top to bottom. Now that I have a little one, cleaning has not been a priority and honestly, it can be quite challenging to keep up with my never-ending to-do list of chores. My days look a little different then they were before baby, but I love being able to put on my Wild Bird Sling with baby in tow and tackle my to-do list. Making it a family affair can truly help get things done and I love having my daughter in tow while getting everything done. Keeping my floors clean can be the most daunting task because of our two English Bulldogs that shed all over the house and track their slobber everywhere. I feel like I am constantly vacuuming and moping our dark hardwood floors. However, since I started using BONA’s Premium Hardwood Floor Mop cleaning the floors is actually an enjoyable task … because of how easy it is to clean. Hey there friends! It’s been a long time, am I right? If you have been following me on Instagram then you know we got married in September and are expecting our sweet babe in February. I have been meaning to start sharing bump dates, but life has kinda gotten in the way. Maybe I will back track and share all about trimester 1&2, but we shall see. One of my biggest struggles during pregnancy thus far as been finding time to just slow down, relax and do something for me. I am a Type A person who is always on the go and slowing down is not a perfect art form of mine, however I have been doing a much better job about it. A typical schedule for me consists of working 7 days straight at my full time job, which is at a hospital, followed by 7 days off. I do pick up shifts at my part time job time to time (you know to keep myself busy) & some of my days off consist of running errands and spending time with my husband, Nick. Before I know it, the week/weekend is over and I am back to working another straight week … while pregnant … with swollen feet and all! ha! Here are some tips that I have started implementing throughout the week to pamper myself, like I deserve! 1. Go to bed early & sleep In. Ok, so this is an area I lack majorly. I am a night out and since I am use to waking up at 5:30/6 AM, my internal alarm clock goes off about the same time every day, even on my days off. However, I have been making appointment to get to bed a little bit early — read a good book, listen to a meditation app or listen to some music. It really makes a difference in how refreshed I feel in the morning. 2. Buy Some Cozy Pajamas. Pajamas are my spirit animal! Pajamas just make everything better. Cozy striped pajamas are perfect for bed but who doesn’t just love lounging in them? I mean, I do! I own so many pairs and am always searching for a new pair to add to my collection. These striped maternity pajamas from Shop PinkBlush are heaven. They are the softest pajamas and I love how they fit perfectly over my belly. I can easily wear them after pregnancy as well. So you can say these will find a permanent place in my pajama collection. 4. Diffuse Essential Oils. I have loved using essential oils for awhile now and really love how come in handy when I am having a rough day, I have a headache that won’t go away or just want to unwind and get a good nights sleep. I love this diffuser and one of my favorite oil combinations are: lavender + cedar wood that I get from Young Living. 5. Drink something warm. Once I found out I was pregnant I cut out caffeine/coffee pretty much entirely. I have it from time to time, but I honestly feel like I don’t need it. However, I do love a good cup of decaf coffee or warm ginger tea (which is my go-to right now!). 6. Pregnancy Pillow. I initially thought pregnancy pillows were the silliest thing ever… until I bought one. LIFE. CHANGING. The pillow I bought literally snuggles my entire body, supports my back and provides me with the best nights rest. I may be sleeping with this pillow well after pregnancy. 7. Get a mani/pedi/massage. This is probably self-explanatory but you really should take some time to get pampered by someone else. I live for foot massages especially, so pedicures have been my go-to. 8. Just say NO. Thats right… just say No! You don’t always have to agree to do anything and everything that is asked of you. It is ok to say … I appreciate the invite but I am going to take it easy tonight. Or I had a long week and I really just need to x..y..z. Trust me, people will understand! So try it! This post is sponsored by Shop PinkBlush. Prepping the house for guests, most certainly means I need to deep clean every inch of our hardwood floors and what better way to do that than with the Bona PowerPlus! The Bona PowerPlus arrived right before Thanksgiving and was immediately put to good use. 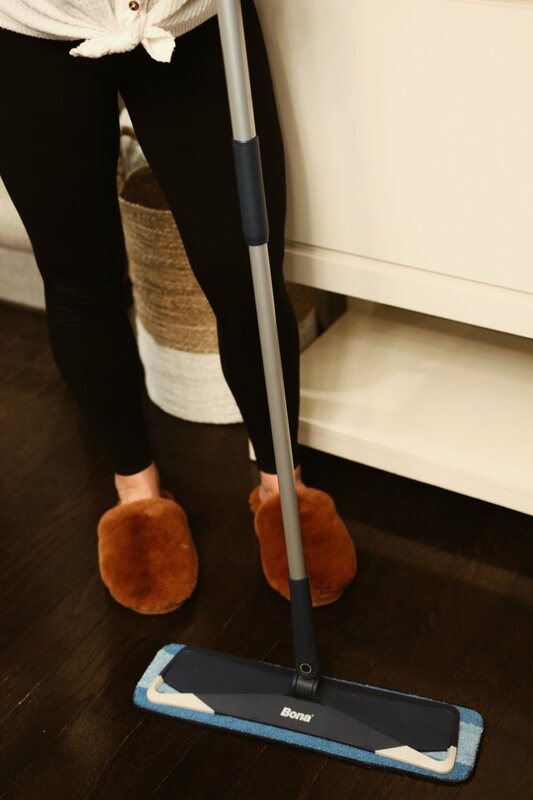 I worked the entire week of Thanksgiving, so when I realized how quick and easy it was to use the Bona PowerPlus Hardwood Floor Deep Cleaner and Bona PowerPlus Microfiber Deep Clean Pad I was elated. The Bona PowerPlus Hardwood Floor Deep Cleaner has an oxygenated formula that loosens and removes heavy dirt build-up, providing a deep clean for your hardwood floors without the extra effort. It is as simple as spraying the deep cleaner on your hardwood floors and using the Bona PowerPlus MIcroFiber Deep Clean pad to break up the dirt and clean everything up. Schedule your cleaning, so you can relax later. Cleaning can be daunting but if you schedule your cleaning throughout the house you won’t be running around last minute trying to clean EVERYTHING. Involve the family. Make sure you aren’t the only one cleaning. Involve your significant other, husband, family or children. Give everyone a designated task and what your home begin to sparkle. Clean Clockwise. If you start cleaning a space and moving stuff around, there is a good chance you may just make that room dirtier or more cluttered then it was before you started. Clean the room by going clockwise before going to the next room. Clean the floors last. The last thing in the house to wind up dirty are the floors. So start cleaning top to bottom and then grab your Bona PowerPlus Floor Mop and Bona PowerPlus floor cleaner and your floors will be the shiniest thing in the house when your guest start arriving. Remember the real reason! Even when everything isn’t coming together as quickly or a nicely as you had envisioned, just keep in mind that family is ultimately the most important thing during the holidays. Whether you realize or not, the clutter will the least of your friends and families worries when you are sitting around laughing, playing games and enjoying each others company during the holidays.